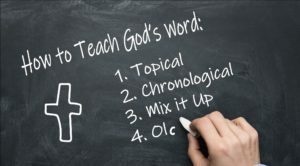 How to teach God’s word to kids… Is there one way that is better than another to teach God’s word? Especially when it comes to kids, how should I teach them? What is most effective? The list goes on and on. To be honest, as long as you are teaching kids the truth, then you are doing good. And if you are teaching them in a manner they receive it well and retain that information, you are doing great! Me personally, I love all these ideas and believe they all have a place; however, my preference is chronological. Why chronological? By teaching from beginning to end, we show kids that God has always had a plan and a purpose for us. Start with the beginning. He created a world that we could flourish in. God knew man would mess up so God even had a plan for that. Everything from the beginning leads to the cross and that leads to us! I believe this will help kids better understand God. How do you read a book? Do you start in the middle? Okay. There are some of you that read the end to make sure they like it before reading the whole story. There may be something to that. How about a movie? Do you fast forward to the end before watching the entire movie? Do you go back and forth throughout the movie? Not typically. We want to see the story, the build up and the resolutions and the big end. We get to the know the characters as we go and often develop a love or hatred toward them too. This is how I like to teach kids. Growing up I was taught popular stories from the Old Testament and then spent the majority of time learning from the New Testament. This was good, after all, I turned out pretty well I think. But I missed so much. I thought the God of the old was mean and harsh while the God of the new was gracious and loving. It was not until I grew up and went back to the old to see that God has been the same since the beginning, just like the bible says. He was loving and merciful even in the Old Testament. Just look at how many chances the Israelite’s got even though they kept going back to idols over and over again. Learning the bible as one big story, God’s story for us, helps us to really learn who God is. From here, we develop a love for God and the other people in the bible, just like kids do with Batman or the newest cartoon heroes. Only when it’s the bible, it’s amazing! Kids wanting to be like Joseph or Daniel, an angel or Jesus… Wow! This makes them want to share their God with others. 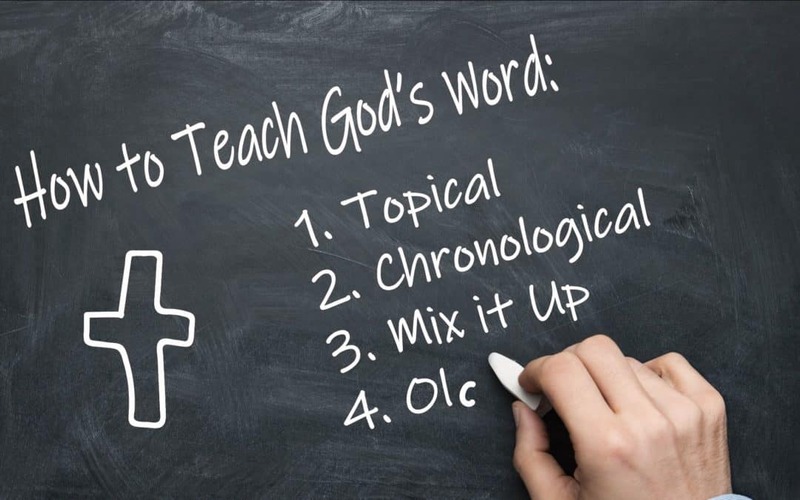 As you go from story to story in the bible, there are topical lessons to learn all the way through! Teaching kids the stories and touching on application prepares them for a life for Christ! When they run into trouble down the road, they will know where to turn for answers. Yes, I prefer teaching chronologically, but I do move away from this at times to promote fun series, mainly for outreach. For instance, I just took the month of October to teach “Scary Bible Stories to Tell in the Dark.” At Christmas, I will have something in honor of the season… more on that to come later. I usually promote a series for my mid-week program and keep my chronological study on Sunday’s since it is a three-year program. Bottom line, do what works for you and your kids. What is important is that they are learning about God, growing in their love for Him and developing a drive to share Him. Lay a solid foundation in scripture so they know where to turn when they need God most. Our goal is to Raise Kids for Christ! 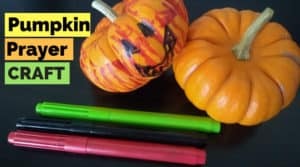 Do you have parents reaching out to you for ideas? 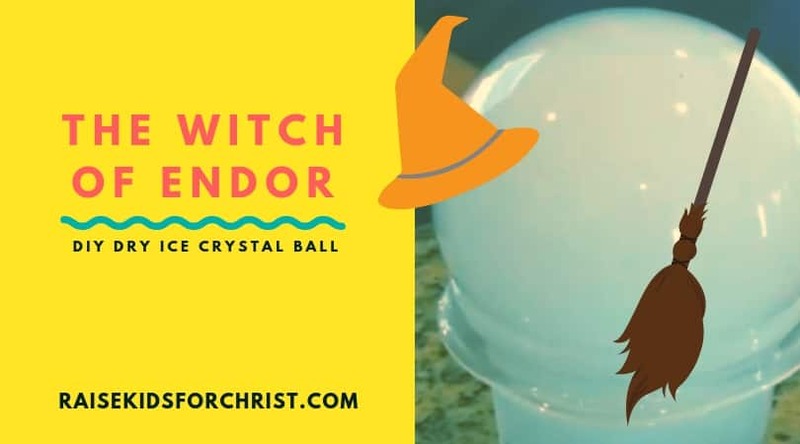 Are they looking for ways to raise their children with God included regularly? I remember as a young parent, I sure was! I wanted my kids to grow into fine young Christians, but was not quite sure how. I was recently given a book called, “Around the Word in 60 Seconds,” a tween devotional book. My kids have grown, but man I could have used this! There are 52 weeks of stories about things tween’s deal with in life. Each week you will find a scripture followed by a short story that a tween can relate to. There’s even an action item and prayer. Then, each day of the week there is another verse and a question to think over helping kids think about how God’s word applies to them instead of them feeling like they are not ready for God. I am providing a link if you are interested, but honestly, there are many options out there. 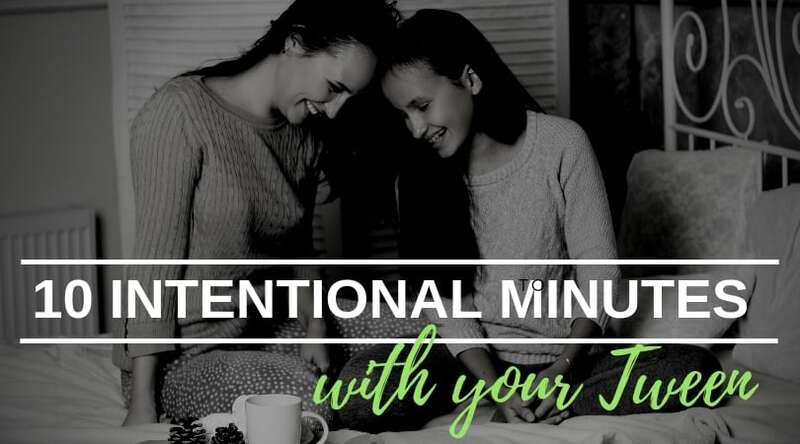 Parents just need to dedicate 10 minutes a day with their kids to talk about God in their lives. 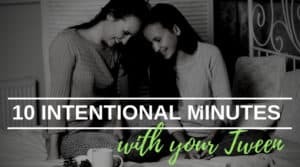 Just 10 intentional minutes a day will go a long way. And let’s be honest, in this culture, we need to arm our children with the Armor of God more than ever before. 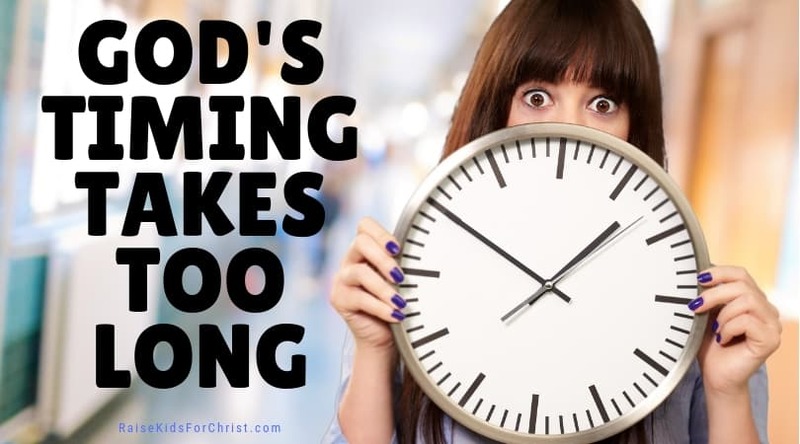 Why is it that God’s timing seems to be so different from ours? We have such grandiose ideas and if God would just bless them now, then I could do great things for Him. As I pondered this thought, I turned to the scriptures for answers. I must admit I was not thrilled at the answer, but I was comforted. God loved Abram. He was a good man, but he and his wife could not have children. And we all know that in that culture, this was highly frowned upon. No children, yet God changed Abram’s name to Abraham, the father of many, and promised him he would have so many descendants they could not be counted. They would be as many as the stars, yet God had not even given them a single child to date. Instead of trusting God to keep his promise, they took matters into their own hands. How often do we try to do this too? And problems came from that calamity of errors; however, God worked through it and eventually blessed Abraham and Sarah with a son, Isaac. This led to a long line of descendants making him the father of many. If we stick with God’s plan, things will be simpler, but God is bigger than our faults and can bring about good in spite of ourselves. Just remember, the path may be bumpier. Later in scripture we read about the Israelites. They disobeyed God so He allowed them to become slaves in Egypt for 400 years. Wow! That’s a long time. But God promised them he would rescue them and eventually, He did. He sent Moses to present the 10 plagues until Pharaoh let God’s people go. They crossed the Red Sea and were free. Of course, they complained. What God provided at that point was not good enough in their opinion. They were impatient. We know the story; God was not finished yet. They suffered some consequences but God gave them beautiful land, land flowing with milk and honey. We need to be patient and trust God’s plan for our lives. Now let’s take a look at Joseph. He was living the good life! He parents were in love and Joseph was his father’s favorite son. Then one day his jealous brothers sold him into slavery. What an amazing attitude Joseph had though. He trusted God and God took excellent care of him. The Pharaoh trusted him with everything! Then because of someone else’s lie, Joseph ended up in prison. From there, Joseph still appears to have had a good attitude, trusting God. It took years, but God worked him back into a position above all but the Pharaoh. Joseph went through some very troubling times, unfair times. He did not say, “It’s just not fair,” and quit. No, he simply continued to trust God’s plan. We are God’s hands and feet on earth and need to allow God to work through us for His purpose. I could go on and on with examples of God providing for His people… in His time. I have so many things I want to accomplish for His church; so many children I want to reach with His word. I will continue to pray for speedy results, but I find it comforting knowing that God has a plan and will bless His ministry the way He chooses in His time. I just need to be ready when He calls. I need to be prepared to be His hands and His feet. Remember, the hands and feet are not the brains. Let’s let God do His job and work through us.